Light apps and a donation bar will be available. Please RSVP no later than Dec. 30th! For nearly thirty years, Georgia, Alabama and Florida have fought over the future rights to that most precious and finite resource: water. 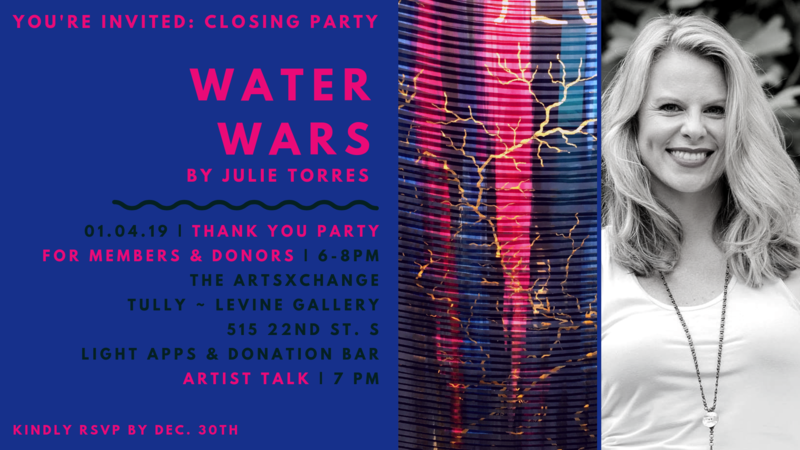 Julie Torres’ exhibit Water Wars focuses on the recently rendered U.S Supreme Court opinion Florida v. Georgia. A former lawyer-turned-artist, Torres uses her artwork to explore the balance between various systems: natural and artificial; societal and legal. Primarily using the technique of screen printing, Torres prints by hand selected text on paper and canvas. Layering the text with images of the shared river basins, she weaves streams of words together to create a visual story and to ask questions: How will we handle the ever-growing demand on our water supply? How do we protect and preserve water quality and quantity? How do we balance the needs of communities that span counties, states, a whole country, a whole world? While the printed words float on the surface of the works, the questions they present run much deeper. Julie Torres is an Atlanta-based artist specialized in the medium of printmaking. Torres graduated with a Bachelor of Arts and a Juris Doctor from the University of Florida in 2002 and 2005 respectively, a Master of Law from the University of Miami in 2008, and a Bachelor of Fine Arts in Printmaking from the Savannah College of Art and Design ("SCAD") in 2016. Before attending SCAD, Torres practiced law for almost seven years. That experience is reflected in the subject matter of her work. Her artwork explores the delicate balance between various systems: natural and artificial; societal and legal. She often incorporates text from legal documents into her art counterbalanced by an aesthetic of delicacy to create an interplay between content and form. Torres has exhibited nationally and internationally. Her work is in private and corporate collections including those of SCAD, Ritz Carlton, J.W. Marriott, Norwegian Cruise Lines and the Jordan Schnitzer Family Foundation.